Shad Gregory Moss, commonly known as Bow Wow, is an American rapper who rose to fame after the release of his debut album Beware of Dog in 2000, which sold about two million copies. 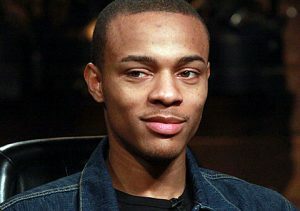 He earned a Billboard Award for Single of the Year with his song ‘Bow Wow (That’s My Name)’. Bow Wow was born as Shad Gregory Moss in Columbus, Ohio to Teresa Rena and Alfonso Preston Moss. He has a daughter named Shai with his ex-girlfriend Joie Chavis. He was formerly engaged to Erica Mena. He attended Hannah J. Ashton Middle School and Reynoldsburg High School. *He started rapping at the age of 5. *Rapper Snoop Dogg gave him the name Lil’ Bow Wow. *He is good friends with Jermaine Dupri, Omarion Grandberry, and Ciara. *Follow him on Twitter, Facebook, Myspace, YouTube, and Instagram.